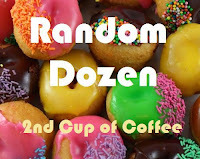 Time for another Random Dozen! Click the doughnuts to check out Linda's blog! Dorothy and Sophia...sad, I know...but I watched a little too much "Lifetime" channel when I was a young mother at home. I pulled through "The Pitt Stop" (yes that's with two t's...and the store is shaped like a barn) for a sausage dog and a 32 oz. Dr. Pepper...for breakfast. Montana. I also would pick Montana as a name for a child, the kind of minivan I used to drive and my favorite US quarter. the glamour, the fame, the fortune...who knew the damage it would do to me as an adult? Considering I watched 11 episodes of "Lost" on Netflix last night, I'm guessing "No"
I live in the South. I ate fried celery at our last church potluck. not sure exactly what I wanted to be, but I knew whatever I became as an adult, it had to include the following: tree climbing, hole digging and fort building...and amazingly those three activities were listed in my current job description! Great, funny answers! Absolutely loved them! Thanks for stopping by my blog! You definitely have a good sense of humor! ~ I don't like celery at all, but maybe if I fried it I would be able to tolerate it! ~ I love blogs that bring a smile to my face! I'll be back!